Monte Cifalco is a high mountain with steep slopes that dominates nearly the whole of the Belvedere massif. 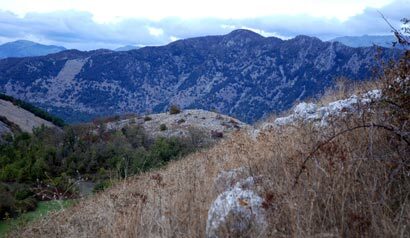 The summit of Cifalco resembles a sugarloaf, a stone wall 400 metres high, pitted with observation posts. It was the ideal location for the German artillery, which pounded the French continuously during the week of fighting. The Germans not only had the ideal position from which to fire their shells, they also had a natural shelter which provided protection from aerial bombardment and artillery fire. Some German shells had a range of 16,000 metres. The Germans even made loopholes in the stone that were remarkably efficient. 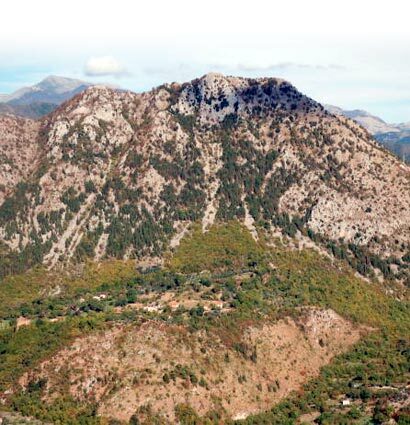 A real natural bunker at an altitude of 947 metres, Cifalco terrorised the French during the fighting. In order to warn the French of the danger from the German artillery at Cifalco, the service units installed signs at many places showing a death’s head with the words “you can be seen at Cifalco“. This time, not a word! We are at the foot of Cifalco. The terrible name is drilled into our brains. We have been staring at it for weeks – the vertiginous headland, the wild cliff, the daunting scree, the sparse vegetation, the suspicious outline capped with snow since the previous day, all its hostile, cunning, spiteful and malevolent features. It alone dominates the landscape, it crushes and possesses it. Nothing can escape, it sees, hears and knows everything. We are at the base and they are up there. At this time, we cannot distinguish it in the darkness, but we can sense its enormous entablature against the livid screen of the sky. It is close by, within easy reach. No, no one wishes to speak.